In Florence we will be staying for 2 nights at the Hotel Pitti Palace Al Ponte Vecchio. 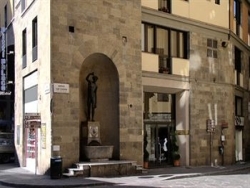 The hotel is located in the heart of Florence, in one of the most striking parts of the historical center, next to Ponte Vecchio, in the Oltrarno district, in front of the Corridoio Vasariano, and a few steps from the Uffizi Gallery and Palazzo Pitti. The hotel's structure is part of Torre dei Rossi dating back to 1200. From the inside, the old stone buttresses of Ponte Vecchio are still visible. The 87 rooms of Hotel Pitti Palace Al Ponte Vecchio look over the medieval Florence, and offer characteristic views of Florence and the Oltrarno neighborhood. All rooms are decorated in warm colors which highlight their simplicity, lines and layout. They feature comfortable beds, spacious armoires, large windows, private bathrooms, air-conditioning, satellite TVs with three channels dedicated to Florentine history, minibars, telephones, safes, hairdryers and are soundproofed. The hotel has a wine bar with panoramic terraces, free Wi-Fi Internet zone, free newspapers at the reception, storage for luggage, and an elevator. In Tuscany, we'll be staying for 6 nights at a Tuscan villa, set among the Chianti Hills: Relais Villa Belpoggio in Loro Ciuffenna. Enveloped by the fragrance of rosemary, sage and lavender, the villa sits among vineyards and olive trees with magnificent views over the Tuscan hills. This family-run estate has a swimming pool, a garden and many walking paths winding their way through the estate. Bike rentals and laundry services are available to the guests. 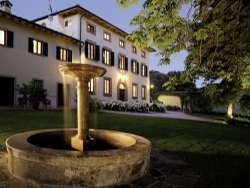 Villa Belpoggio is located in a restored historical building, with 10 antique decorated guest rooms and 2 apartments. The setting, the beauty of the garden, the swimming-pool, the genuine Tuscan hospitality and the variety of artistic, wine and food itineraries make the stay at Villa Belpoggio an unforgettable experience. All rooms have private bathrooms, air-conditioning, direct dial telephone, hair dryer, minibar, coffee/tea maker, writing desk, satellite TV and a safe. Each room is uniquely furnished with antique furniture and modern amenities. The rooms have been carefully restored in the original Tuscan style with terra-cotta floors, wood beamed ceilings and stone walls, with walls the color of sage, blush, saffron, sky blue and ochre yellow. The antique furniture is complemented by Tuscan vases, glass and ceramics. The tasty farm breakfast consists of homemade cakes and tarts, Tuscan ham, pecorino cheese and bruschetta. The villa has free WiFi Internet access.